Last week I was finally able to watch the 2017 season of The Great British Bake-Off. (Online, of course, as PBS seems not to have the ability to broadcast it in the US since the show said goodbye to the BBC.) It was as brilliant as ever, and though I loved Mary, Mel, and Sue, I am now equally fond, if not more, of Pru, Noel, and Sandi. 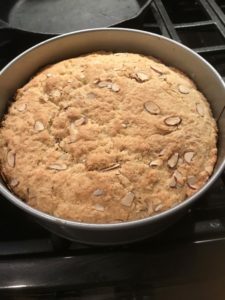 And naturally, I have been baking stuff ever since, much to my husband’s disgruntlement–I create a monumental mess in the kitchen when I bake, and baking makes me slightly frazzled since it does not come naturally, and I never manage to get anything else done, like dinner. 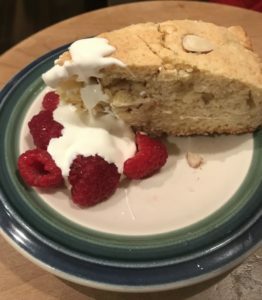 Last weekend I made bread, shortbread, and homemade gnocchi, so I was forgiven. 1757. INGREDIENTS – 1/4 lb. of butter, 6 oz. of currants, 1/4 lb. of sugar, 1 lb. of dried flour, 2 teaspoonfuls of baking-powder, 3 eggs, 1 teacupful of milk, 2 oz. of sweet almonds, 1 oz. of candied peel. 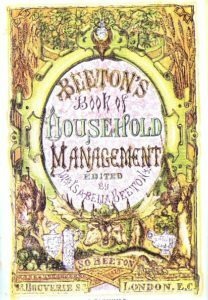 Mode.—Beat the butter to a cream; wash, pick, and dry the currants; whisk the eggs; blanch and chop the almonds, and cut the peel into neat slices. When all these are ready, mix the dry ingredients together; then add the butter, milk, and eggs, and beat the mixture well for a few minutes. Put the cake into a buttered mould or tin, and bake it for rather more than 1–1/2 hour. The currants and candied peel may be omitted, and a little lemon or almond flavouring substituted for them: made in this manner, the cake will be found very good. Time.—Rather more than 1–1/2 hour. Average cost, 1s. 9d. If traveling in England and watching GBBO has taught me anything, it’s that the British love their cake. So how, you might ask, could I not try to make A Nice Useful Cake? I just don’t have that kind of self-restraint. Preheat oven to 350. 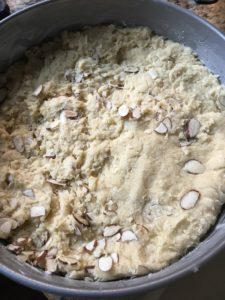 Mix together the flour, baking powder, salt, and almonds. Set aside. Cream the butter and sugar with an electric mixer. Add eggs to butter mixture, one at a time, beating well after each addition. Beat in the milk and vanilla. Add the dry ingredients and mix well. The dough will be far closer to the consistency of scone dough than cake batter. Serve with fresh berries and whipped cream or creme fraiche. Enjoy!